Today, I have a super exciting post for you guys. I was lucky enough to be sent an Uppercase subscription box for the month of September to review! 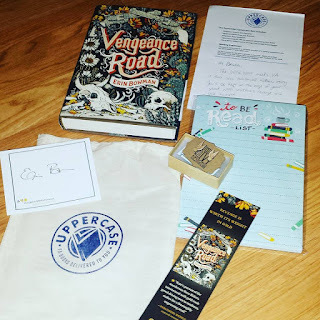 Thank you so much Lisa for allowing Reading Teen the opportunity to convince all of our readers that Uppercase is the subscription box they need in their lives! Uppercase is a monthly subscription box for Young Adult book lovers. Each box contains a brand new, recently published YA book that Uppercase has personally read and recommends (which is ALSO either signed by the author or comes with a signed book plate), 1-2 bookish bonus item(s), a handwritten, personalized letter explaining why they chose that specific book, access to exclusive author content and a Goodreads group to discuss the book. Expert - $23, which includes everything I described above. Personalized - $29, This is the plan to pick if you are scared you're going to get a book you already own. Lisa, the founder of Uppercase, will personally pick a book based on your tastes. Book Exclusive - $17, which is exactly what the name suggests, it is exclusively the book and bonus content, plus publisher-provided goodies that come in the Expert box. It will just be missing the bookish item. Still not sure whether you want to take the plunge into the greatest surprise you could gift yourself (or a friend) with every month? Take a look at some of their past box selections! Uppercase has been up and running since August 2014, so you have plenty of pictures to peruse through. So enough of my babbling...you probably want to know WHY I think this box is so great. What exactly ARE those 5 reasons to subscribe to Uppercase? 1. It's the best surprise to gift yourself with. Sure you might not know what book you're going to get. You could possibly already own it. BUT I'm a pretty avid book buyer, which is what made me hesitant to subscription boxes in the first place, but this was a book that I really wanted, and hadn't bought yet! I was amazed! Of course, Uppercase recommends you don't purchase any newly released books (in the past month) just in case you get a duplicate, but the chance is very slim. 2. It comes in this epic packaging. Uppercase was shipped to me via Priority USPS, which was great because I was sent a tracking number, and it was on my porch extremely quick! I opened the envelope, and found this adorable printed Uppercase bag, which sort of made me squeal just a tiny bit, because I'm a bag/tote lady (remember? ), and I have the perfect use for it. Although, I'm not sure if I want a whole bunch of them. I don't know what I would do with a year's worth of them. 3. It's pretty cheap for a subscription box. From the research I've personally done, I've found that most boxes are around $29 plus shipping, which is kind of too much in my opinion. But I could totally get behind the $23 (plus shipping), because that's just a little bit more than what you would pay for the book anyways, and the extra content/bookish items totally make it worth it! 4. The extra bookish items are EXCLUSIVE only to Uppercase subscribers. That's right. If you aren't a subscriber and want that super cute To Be Read notebook I got in the September box, you can't. (I kind of feel like inserting an evil muahaha laugh here). That should be reason enough, because every single past month's exclusive items are things that I want, and I'm kicking myself for not subscribing sooner, because I NEEDS THEM! 5. The Behind-the-Scenes content is a book lover's dream. I mean, who doesn't love knowing insider info about the book you're reading? Each book comes with little sticky notes on certain pages that are the key to a truly unique reading experience. Just type in the website and code word, and unlock all types of polls, videos, and questions that pertain to that specific part of the book! Honestly, I wasn't expecting to be as blown away by a subscription box. I was definitely not planning on eventually subscribing to one. I just didn't think it was a "Becca" kind of thing. But this Uppercase Box popped my subscription box cherry, and I'm never looking back. I can't think of anything bad to say about Uppercase. The customer service was superb. The shipping was fast and efficient. The packaging was subtle, but professional and unique. The book was a fantastic choice! I think my favorite part was the handwritten, personalized note. I loved the fact that Lisa took the time to write each of her subscribers a heartfelt little note about why she chose the specific book she did. I think what makes Uppercase stand out from other subscription boxes is the fact that Lisa knows what she's doing. She's been in the book blogging world for the past 4 years, and knows what readers expect/want from books and extra bookish goodies. You can definitely tell she puts a lot of work, thought, and detail into each item. Plus the fact that each book comes with an exclusive reading experience with exclusive content. You can't get that anywhere else as far as I know, and it makes Uppercase wholly unique in that respect. If you're on the fence on whether or not to describe, take it from one recently converted subscription box newb to another, just do it. You won't be disappointed-- I can guarantee that. P.S. Those HP earrings are totally my new favorite thing.